• FOX direct-replacement shocks should always be installed as a pair for maximum performance. • Proper installation and service procedures are essential for the safe and reliable installation of chassis parts, requiring the experience and tools specially designed for this purpose. Installation and maintenance procedures for this product must be performed by a qualified service technician, to avoid potentially unsafe vehicle handling characteristics, which may result in SERIOUS INJURY or DEATH. 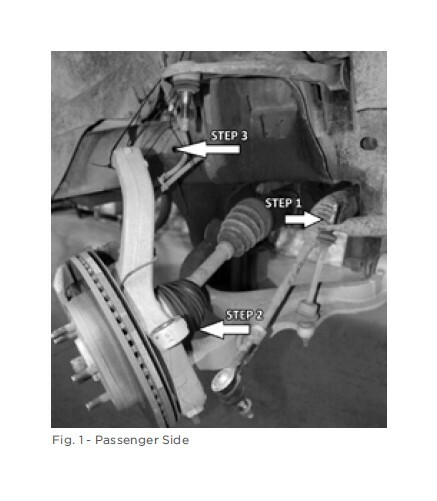 • Modifying your vehicle’s suspension will change the handling characteristics of your vehicle. Under certain conditions, your modified vehicle may be more susceptible to loss of control or rollover, which can result in SERIOUS INJURY or DEATH. Thoroughly familiarize yourself with the modified vehicle handling characteristics before any rigorous vehicle operation. Wear body protective gear including head protection when appropriate. Installation of vehicle roll bars or cage is highly recommended. • FOX direct-replacement shocks are gas-charged and are highly pressurized. Placing shocks in a vise or clamp, applying heat, or attempting to open or service the shock without the proper tools and training can result in SERIOUS INJURY or DEATH. Do not attempt to modify, puncture or incinerate a FOX direct-replacement, coil-over shock absorber. • Any attempt to misuse, misapply, modify, or tamper with any FOX product voids any warranty and may result in SERIOUS INJURY or DEATH. • Always use a chassis lift for the installation of shocks, and make certain that the raised vehicle is securely attached to the lift to prevent the vehicle from slipping, falling, or moving during the installation process. • DO NOT install any FOX product without the necessary special tools, expertise and chassis lift, or you will subject yourself to the risk of SERIOUS INJURY or DEATH. If you elect to not use a chassis lift (which election may result in SERIOUS INJURY or DEATH), ensure that the vehicle is on level ground, that all tires on the ground during installation are blocked to prevent vehicle movement, that at least two tires are on the ground at all times, and that adequately secured jack stands are used to support the vehicle. NEVER get under the vehicle until you have checked to ensure that the vehicle will be stable during installation. • FOX direct-replacement shocks are designed to fit your vehicle’s shock mounts with no modifications with the exception of reservoir placement on specific models and applications. Medium-strength thread-lock (blue Loctite®) is recommended on all bolts. 1. Please read the installation guidelines for instructions on how to properly lift and secure the vehicle. 3. Remove both front wheels. 7. Remove the (3) top nuts that secure the stock shock assembly to the vehicle. DO NOT remove center nut; doing so will release the spring from the stock assembly and could result in SERIOUS INJURY or DEATH! 9. Remove the stock shock assembly. You may need to use a pry bar to lower the suspension enough to remove the stock shock. Be careful not to damage any brake lines or electrical wires. 11. Connect the shock assembly to the lower control arm, reusing the stock bolt and nut. Torque to factory specifications. 12. On the external reservoir models, install the reservoir bracket by placing on top of the vehicle coil-over bucket and align the bracket center hole with the outer center hole of the shock top hat, install supplied bolt and torque to 24 ft*lbs. 13. On the external reservoir models, install the reservoir onto reservoir bracket using two supplied clamps. Utilize the slots in the bracket to locate clamps. Do not feed clamps through the slots in the brackets. 14. Reconnect upper control arm to steering knuckle on both sides and torque to factory specifications. 15. 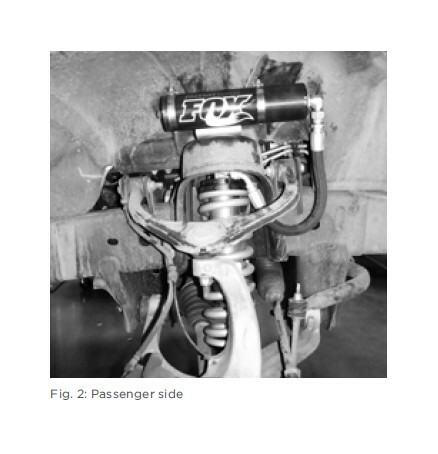 Reconnect the sway bar on both sides and torque to factory specifications. 17. Check that the suspension has proper clearance by steering completely in both directions. 18. Reinstall both front wheels and torque to factory specifications. 20. It is highly recommended that you have your wheel alignment checked. 2. Remove fender liners from each side of vehicle. 5. 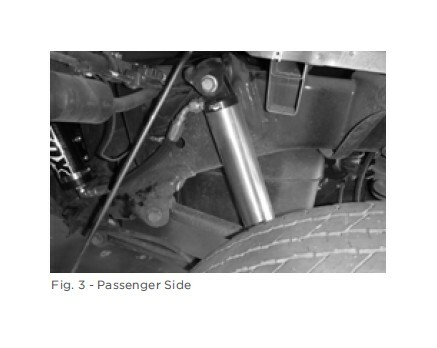 For external reservoir models, install supplied reservoir brackets onto the vehicle frame as shown (Fig 4). Align lower bracket hole approximately 1.5’’ from factory bed mount bracket toward the front of the vehicle and vertically 2’’ above welded seam on side of frame. Mark hole and drill a 7/32’’ pilot hole, then secure the reservoir bracket to the frame with one of the supplied 1/4’’ self tapping screws. 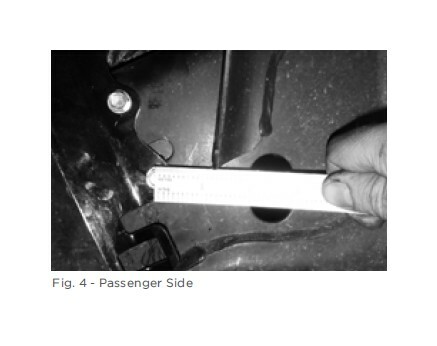 Angle bracket approximately 45 degrees toward the front of vehicle. Repeat marking and drilling the upper bracket hole and installing self tapping screw. 6. On external reservoir models, install the reservoir onto the reservoir bracket using the supplied hose clamps. Utilize the slots in the bracket to locate clamps. Do not feed clamps through the slots in the brackets.